1) Gin’s origins are Dutch. British troops fighting the Thirty Years War got somewhat hooked on a local tipple, called “jenever” – the Dutch name for juniper, the key flavour in the drink. 2) Gin, however, is definitely English. The juniper comes from the Dutch spirit, but the recipe and method that gives us gin is, officially, all ours. 3) Mind you, before we move on from all the geography, it’s worth noting that those soldiers, given tots of jenever to ward of the effects of the damp conditions in the Lowlands, were participating in the process that gave us the expression “Dutch courage”. 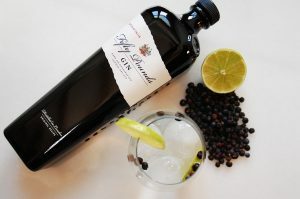 4) And, finally – well, possibly, there could be more – Gin may have been inspired by Holland, and perfected in England but it’s drunk mostly in The Philippines? Filipinos consume a remarkable 1.4 litres per person every year, compared to the UK’s paltry-by-comparison 0.4 litres. 5) While – sort of – talking about “Dutch Courage”, gin has had many other slang names. You’ve no doubt heard some – “Mother’s Ruin” for example – but others include Ladies Delight, Hollands, White Satin, Royal Poverty and Flashes of Lightening. 6) Food and wine is a common pairing. Food and beer is something that’s becoming increasingly common. Gin, however, was paired all the way back in 1731. It rocks, apparently, with gingerbread. Go on. Try it. We’ll wait. 8) Coriander is a bold choice, mind you. Some people love it but many don’t. For those that don’t, it’s not even a question of taste. It’s actually a scientifically proven genetic thing. 9) Fifty Pounds Gin is a London gin. That’s not because it’s where we make it. London Gin is a defined style, where the predominant flavour must be juniper and its flavour must come from the distillation process – you can’t add flavours, or colour, after distillation. 10) The only true Martini is a gin Martini. Technically, the vodka Martini – sorry Mr Bond – is a cocktail called The Kangaroo. 11) On the subject of Martinis, the famous glass it’s poured in only became the Martini glass in the 1990s. Before that, it was known simply as a cocktail glass. 12) While James Bond’s coolness may have been undermined by the above revelation – “I’ll have a Kangaroo, shaken not stirred” doesn’t quite work, does it? – creator Ian Fleming IS credited with creating a drink. The Vesper – gin, vodka, and vermouth topped with a lemon twist – is named after a character from his 1953 novel, Casino Royale. 13) The biggest mystery though is where the name Martini actually comes from… It’s possibly named after Californian town Martinez but, like so many cocktails, the origins are rather murky. 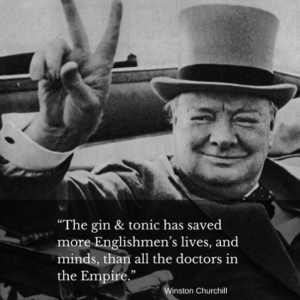 15) As it happens Churchill might have a more literal point than he perhaps realised: the distinctive bitter flavour of tonic comes from quinine, derived from the bark of the cinchona tree and a celebrated cure for malaria. Even though the cinchona bark from which quinine is derived is brown, the first tonic water was clear. This is because even the earliest tonic waters were made with quinine directly, not the bark. 16) And it’s not just quinine that helped prevent disease. Juniper is a natural flea repellent. During the years of the plague, doctors would wear masks filled with juniper as they believed it protected them from bad odours, the then suspected cause of the plague. They were only half right, but it’s still a win. 17) Sir Francis Chichester claimed his successful solo circumnavigation of the globe was due to a daily pink gin – gin, water, angostura bitters. He also said that the saddest day of his nine-month-and-one-day voyage was, inevitably, the day the gin ran out. 18) A Bloody Mary is vodka and tomato juice. A gin and tomato juice – a celebrated hangover cure years before the Bloody Mary became a thing – is known as a Red Snapper. 19) British sailors famously received a daily rum ration. It was worth working for promotion however as British naval officers got a daily ration of gin. 20) There is a problem with the juniper berry. It’s not actually a berry – in fact, it’s technically a pinecone. 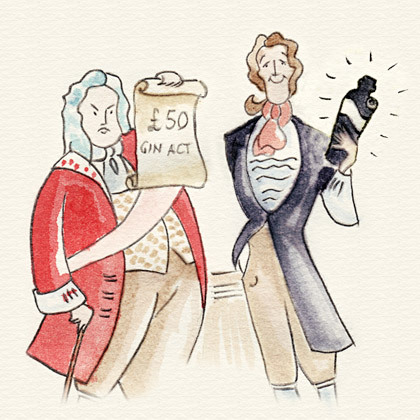 21) Our name comes from the Gin Act of 1736 which imposed an annual fee of £50 on distillers of base spirits. By the time the fee was abolished in 1742, it had only been paid twice. 22) The fine was introduced to restrict the illegal production of gin. 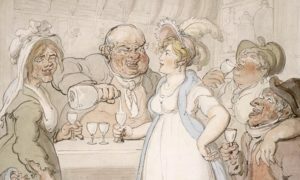 It was probably required – at the time it was introduced, around one in five London properties was producing gin. 23) The rise of the “balloon glass” – the “copa” – originates in Spain. The point of the glass is to hold more ice. Contrary to what you might expect, the more ice there is, the less it will melt and dilute the important content. 24) Mind you, if it did dilute the contents, the results could be useful – if left a while. Experts suggest the best way to taste gins for comparison is to dilute the gin with an equal measure of water and sample it at room temperature. 25) The traditional gin still features a narrow pipe at the top. This is known as “the swan’s neck”.